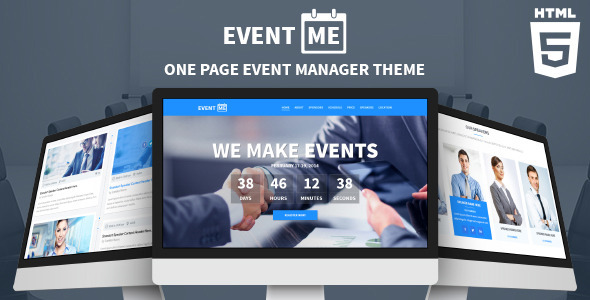 Now choose the wisest way to manage your Event Management business with the incredible EventMe-Responsive Event HTML template specifically designed for you. It is more than just a theme. Don’t let your events get lost in the clutter of the ordinary, Grab the EventMe HTML template and go great. We tried to keep it as clean as possible. Doesn’t matter if you view it on the large screen or on your phone, EventMe will always look like it should. Based on the latest version of a greatly popular framework. This gives you a great ability to modify and customize your site, thanks to the great supporting community on the Internet. Twitter Bootstrap. Developer friendly code based on Twitter Bootstrap 3. Images Used in the Preview are not included in the template. You must use your own for your website. EventMe is a one page HTML5 template for any type of events which has all the needed UI elements.